Christ the Redeemer parishioners reach out to the local community in a variety of ways. Through several church-led ministries, volunteers and give their time, talent and treasure to help those in need. Find out how you can help with a group that suits you. 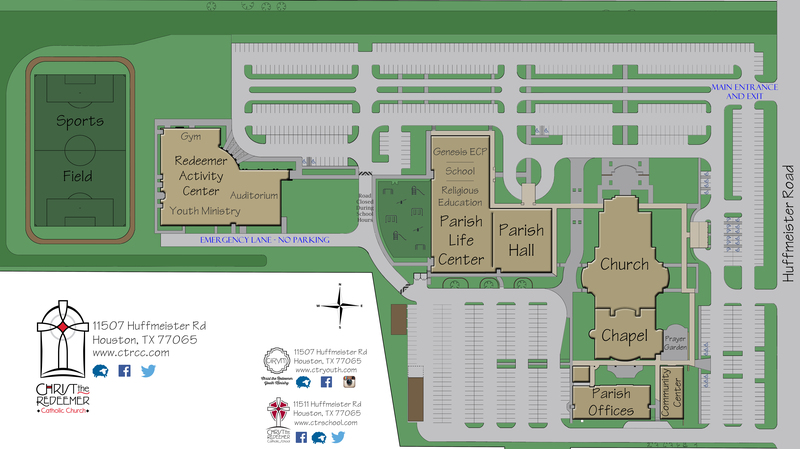 Christ the Redeemer partners with Rejoice Counseling Apostolate to provide counseling services on-site at the parish. Their parish counselors are experienced in bridging professional counseling with the Catholic faith. Counseling is available for individuals, couples and families. Fees are offered on a discounted, sliding scale for parishioners to ensure anyone from the parish can receive help. Learn more about our Parish Counseling Services online at www.myparishcounseling.com/ctrcc. In 2015, Christ the Redeemer entered its 17th year of partnership with the Gulf Coast Regional Blood Center. Through the stewardship of our wonderful donors, more than 1,200 total donations have been collected to date and countless of lives saved. More than 170 hospitals and healthcare facilities receive blood components from the Blood Center and several of those facilities are located here in Cypress. With so many relying on our support for these blood components, your support of our parish blood drives is crucial. You may never know the people whose lives you may one day save, but they know you through your love and gift-of-life donation. Please give the gift of life during our parish blood drives. If you are a registered Digital Donor through Gulf Coast Regional Blood Center, visit their website to sign in and schedule your appointment. For more information, contact Marty Weidemann at 832-338-8400 or martyatm93@yahoo.com. The purpose of the Food Drive ministry is to provide food replenishment to the pantry at Cypress Assistance Ministries,or CAM, to help meet its needs in serving the local community. The CtR CAM Food Drive is scheduled for the first full weekend of each month year round. Also, see the holiday food pantry needs. Volunteers, assigned to each Mass, are needed to arrive early to place the food drive wagons right outside the church entries. After Mass, volunteers then accumulate all food donations in the parlor for CAM to pick up Monday morning. The time commitment is minimal, and it is an easy way families, with children of all ages, can work together serving our parish and helping meet the needs of CAM. For more information, contact Ministry Coordinator Belinda Richardson at 281-463-8150 or bel_vic@sbcglobal.net. Bring your monthly donation to CtR. Bring your monthly donation to Mass. Join the committee to welcome new families to our parish! Contact us to attend a meeting. Support mothers in the Archdiocese through the Baby Bottle Blessings Program! See details online.